When it comes to video editing and compositing, there is a variety of software you can use. One of the free video compositing and editing software is Cinelerra. This is a 64-bit media production application that is compatible with Linux only. 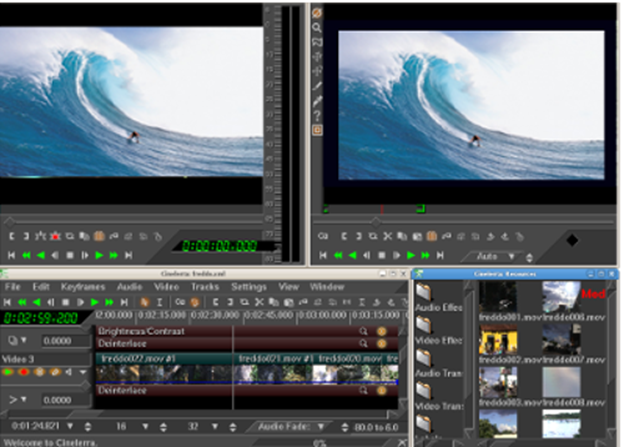 Cinelerra is among the most sophisticated open-source non-linear video editing and compositing software for Linux. The software supports high-fidelity video and audio using 64 bits of precision. Cinelerra was developed by Adam Williams in June 2000 as an open source software running on Linux. It was officially released in August 2002 and was based on Broadcast 2000, which was an earlier product that was first released in 1996. Heroine Virtual produces Cinelerra and distributes it as a free software according to GNU General Public License. After it was rewritten to correspond to the AMD Opteron in 2003 and was exhibited in SIGGRAPH 2004 at San Diego, it became the first 64-bit media production software. This version was then released by Adam of Heroine Warrior who was also the chief developer of Cinelerra. 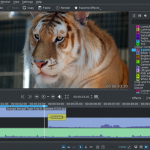 Cinelerra’s user interface is similar to that of other Non-linear editing systems like Final Cut Pro, Avid Media Composer, and Adobe Premiere Pro. It uses its own widget toolkit that does not conform to the human interface guidelines of major Linux desktops like KDE and GNOME. The timeline gives the user a time-based view of all video and music tracks in the venture and a key frame data for effects, camera movement, or opacity. This screen provides the method for scrubbing through footage. This allows the user to manually move the play head backwards or forwards to locate a particular word or cue. The resource window presents the user with a view of all video and audio resources in the project and audio and video effects and transitions. This screen presents the user with a view of the final project, as it would look when rendered. It is interactive as it lets the user adjust positions of video objects and updates in response to user input. Cinelerra software is available in the 64-bit version. Cinelerra supports high fidelity audio and video. It processes audio using 64 bits of precision and works in both YUVA and RGBA color spaces using 16-bit integer representations and floating-point respectively. It is not dependent on resolution and frame rate which enables it to support video of any speed and size. Cinelerra offers real-time processing of video including the processing of the time domain, out of order. It also aids in track bouncing, side chinning, and reuse of effects between many tracks. The audio can be played through the timeline, from capture source. Cinelerra supports OpenGL on some NVidia graphics cards that greatly accelerates playback which depends on the driver and card. It works only in NVidia because it was written in GLSL. Although Cinelerra does not support every codec, it supports the FLV and WMV derivatives sufficiently well to transcode them into a format suitable for editing. You can edit most formats straight off the DVD, original file, or Blu-ray without transcoding. The format that all your online video networks import, H.264, video + MPEG4 audio on Quicktime, is the conventional export format. Renderfarm is compatible with background rendering, resulting in a theoretically infinite maximum speed. You do not need to pay for node licenses when using Cinelerra’s renderfarm. You can install nodes without paying for either the operating system or the application. Cinelerra lets you retrieve images in the best possible fidelity with a floating point file and imaging formats. You can adjust color levels without losing data, and you do not have to estimate how far out of range of colors are. You can also save great dynamic array intermediates for many steps without losing information. Cinelerra has gained popularity among Linux enthusiasts looking for a video editing system that is native. Linux Media Arts promotes the professional use of Cinelerra and sells integrated hardware and software package for video production such as Cinelerra. In 2004 Electronic Media Show, Cinelerra received the Bob Turner’s “Making the Cut” award for being the best and most exciting post-production software. The project is pursuing commercial interests aiming at offering its users professional support. It is organized to combine all existing Cinelerra projects while also providing extra enhancements and fixes. Since 2015, Cinelerra has had an open Git repository on Google Code for input ad analysis. The primary goal of Cinelerra.org is to create a more professional value to the product as of 2016. Since the appearance of Cinelerra.Org in February 2014, it was uncertain if Adam Williams was to keep working on Cinelerra via Heroine Virtual or if the development would be carried on in Cinelerra.Org. Due to lack of communication by Adam, this was decided months later in December 2015 when Cinelerra 4.6.1 was launched. To differentiate between the various modifications of the software, the releases made by Heroine Virtual are called Cinelerra-HV. A new release of Cinelerra is released semi-annually as a source code by Heroine Virtual. Any problems and usability issues are fixed by the community and submitted to Heroine Virtual often resulting in no immediate response. Releases are the only indication that Heroine Virtual has incorporated these changes. Due to the latency in the development and distribution-specific nature of the publications, a group of free and open-source software engineers built their version of Cinelerra called Cinelerra-CV where CV represents community version. Cinelerra-CV lets the community to contribute to an open repository where amendments to the code are accessible to everybody. There exist mailing lists and an IRC channel where experts and developers provide support to inexperienced users and have technical discussions. Cinelerra-CV has a different compilation system: system libraries are extensively used, and the automake/autoconf tools are used to configure the compilation system. The relationship between Cinelerra-CV and Heroine Virtual is friendly. Heroine Virtual sometimes contributes to discussions on the mailing lists and includes many of the amendments made in the repository. Till Cinelerra 2.1, the updates of Cinelerra-CV followed those made in Heroine Virtual. Cinelerra-CV examines the changes introduced by the new version made by Heroine Virtual and merges them into their version. Since the release of 2.2, Cinelerra-CV uses its versioning scheme but still incorporates code from Cinelerra-HV. Cinelerra announced a comprehensive rewrite of the current community version called Lumiera in early April 2008. It was conceived as a revision of the Cinelerra codebase known as Cinelerra3 but was soon separated into an independent venture having its distinct name. Lumiera has been in the pre-alpha stage for long, but it’s still under active development despite the fact that nothing significant has ever been launched. Notably, Lumiera does not use Guicast which is used by Cinelerra as the GUI widget library. GTK+ is the native interface of Lumiera although other interfaces will be possible. Selecting the appropriate video editing software is a daunting task because there are many software that serve the same purpose. Additionally, most software brands have the same features which make selecting a good video editing program hard. Here are the factors you should consider when looking for a video editing software that is perfect for you. Video editing varies from project to project and from person to person. You should consider whether you want to record as a professional filmmaker or just in an informal setup. An informal set up such as recording your daughter’s first birthday does not require sophisticated software, but professional filmmaking needs a complex program with a budget of more than $500. It is not recommendable to buy software that has functionalities that you will never use or understand. Video editors are available at different prices from free software to advanced ones worth as much as $3000. It is essential to budget to avoid wasting money on software that you do not need. You should go to the market with that budget and get an editor with a price range you had budgeted for. It is essential to perform a cost and usage analysis to ensure that you get the maximum value for your money. This is a very important factor to consider when looking for a video publishing software. There are numerous video formats because of the overwhelming variety of devices that can record a video. It is essential to confirm the file format of the video that you will be using and compare it against the video formats compatible with the software you are considering to purchase. Ensure that the video editor supports the video format you will be using. As there are countless different computers, so are their hardware and software specifications. You should make sure that your computer meets the software requirements of the video editor. Video editing consumes lots of resources especially the RAM. Ensure that the specifications of your computer double the requirements of the software. For instance, if the software needs 4GB RAM, ensure that your computer has 8GB RAM. More importantly, you should test whether the software works on your computer before purchasing it. Ensure that there is a free trial for the software you intend to purchase. Companies that believe in the quality of their software typically offer a free trial for their product. You should not buy software that does not have a free trial. This ensures that you choose the perfect software for you especially where money has to exchange hands. After you are through with editing the video, you might want to share it across different platforms on the internet and social media sites. To share the video, the software must be equipped with the required functionalities and features. There are software that have extensive social capabilities built in that even allow you to compress the video for online upload. Thus, you should consider the software that has an inbuilt capacity to share the video across various media. It is essential to consider how the video editing software will work once installed on your desktop. Fortunately, most High Definition videos are recorded digitally, which makes it easier and faster to transfer it from software to PC and vice versa. However, it is important to ensure that the software does not create additional requirements while transferring the clip to and from the desktop. 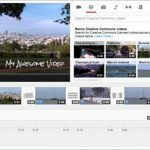 Whether you are a professional filmmaker or just an ordinary person who shoots a video for fun, you do not want a video editing software that is sophisticated and time-consuming to use. You need to consider the usability of the software so you can efficiently and quickly make videos without much hassle. The features that come with different software can vary widely. You need to take your time to review the available features in each software. This is important as it affects the type of videos you will be capable of producing and how quickly you can produce them. Considering the above factors lets you narrow down the search for video editing software. It is advisable that you compare other software against your budget and needs to select the software that serves you efficiently and gives value for your money. Cinelerra announced a comprehensive rewrite of the current community version called Lumiera in early April 2008. It was conceived as a revision of the Cinelerra codebase known as Cinelerra3 but was soon separated into an independent venture having its distinct name. Lumiera has been in the pre-alpha stage for long, but it's still under active development despite the fact that nothing significant has ever been launched. Notably, Lumiera does not use Guicast which is used by Cinelerra as the GUI widget library. GTK+ is the native interface of Lumiera although other interfaces will be possible. We collect all-round information and reviews of media software and provide complex enterprise-level solutions. With blend of technology skills, hands-on experience and effective methodology, we will continue to flourish in providing solutions for video editing and other media processing to make our customers’ digital life easier in the future!